Greater Prairie Chickens (Tympancichus cupido pinnatus) commonly nested in Iowa until about 1900. In the 1880s prairie chickens were the most abundant gamebird on Iowa’s prairies. Bags of 25-50 a day were common and some hunters took as many as 200 a day. By 1878, Iowa’s lawmakers were concerned that prairie chickens were being over harvested and limited the daily bag to 25 birds per person. This is believed to be the first time daily limits were used to regulate harvest. Additional restrictions continued to be implemented as the population continued to decrease with 1915 as the last year a season on prairie chickens was held. Agricultural land use also contributed to the decline of prairie chickens, which continued after the overharvesting was ended. 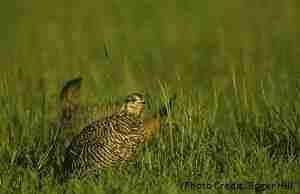 The last known nesting of prairie chickens before reintroduction was in 1952. In the early 1980s, the Iowa Conservation Commission, the precursor to the Iowa Department of Natural Resources (DNR), made its first attempt to reintroduce prairie chickens. Although 101 birds were released in the Loess Hills, east of Onawa, Monona County, no permanent leks, the communal ground for breeding displays, were found and only the occasional prairie chicken was seen, leading to the conclusion that this reintroduction attempt failed. A second restoration attempt was started in 1987, this time at Ringgold Wildlife Area, located two miles north of the Missouri border. Between 1987 and 1989, 254 prairie chickens were translocated. By the spring of 1988 leks had been established at the release site and at a site 15 km south in Missouri on Dunn Ranch, which was a historic lek site before the prairie chickens got extirpated from the area. 1990 and 1991 had poor reproductive conditions for the birds, but brood sightings were still made every year. By 1991 the prairie chickens seemed firmly established at Dunn Ranch, though only one lek in Iowa with only six males could be found. The success at Dunn Ranch proved that the species could be restored. Restoration attempts continued. Between 1992 and 1994 a total of 304 prairie chickens were released in Iowa. It was during this release period that the Kellerton lek, Iowa’s main lek site was firmly established. Currently the DNR is following the 2012 Iowa Management Plan for Greater Prairie Chickens, which included a detailed analysis of habitat in Ringgold County and recommendations for managing the habitat for prairie chickens. The plan also included a continued translocation effort that ended (at least for now) in 2017 to bolster the diminishing population of birds. The reintroduction efforts have resulted in a small population of prairie chickens in a concentrated area of southern Iowa and northern Missouri. The Iowa Management Plan for Greater Prairie Chicken has set objectives for prairie chicken population numbers as well as objectives to enhance the landscape to increase the amount of native grasses and provide more habitat for chickens and other grassland dependent wildlife.